White Entangledand Organic Ship are signature sculptures in which the play of light through the open form expands the art of the piece. The introduction of closed forms as in Dragon Eggand Texted Egg contrast light’s transcendence with the density of matter--the embryonic with the life that has lived. 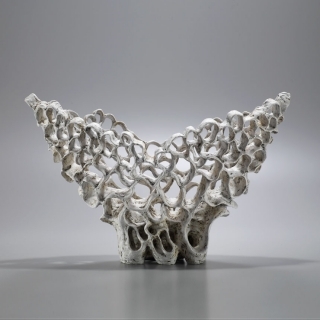 Åberg was first introduced to the USA in From the Kilns of Denmark, the seminal international exhibition on contemporary Danish ceramics opening at the Museum of Arts and Design in 2002, then traveling to four other American museums before going to Paris and Berlin. She was featured in Lacoste Gallery’s A View from Denmarkin 2008 and six times at SOFA NEW YORK and SOFA CHICAGO, the premier art fair for material-based art in the US. This was followed with a two-person show at Lacoste Gallery with the Danish artist Hans Vangso. This is her first solo at Lacoste/Keane Gallery a new iteration of Lacoste Gallery. Åberg’s sculptures “bring us to places within ourselves that we rarely explore. The undefined, non-rational, the unknown. The silent space where we’re simply human, experiencing the vastness of existence.” Louise Mazanti, art historian, writing on Åberg’s ”Skeleton of Existence” exhibition in Denmark.